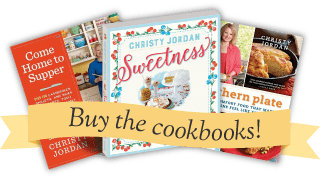 Make Ahead Breakfast Quiche – Easy and Customizable! 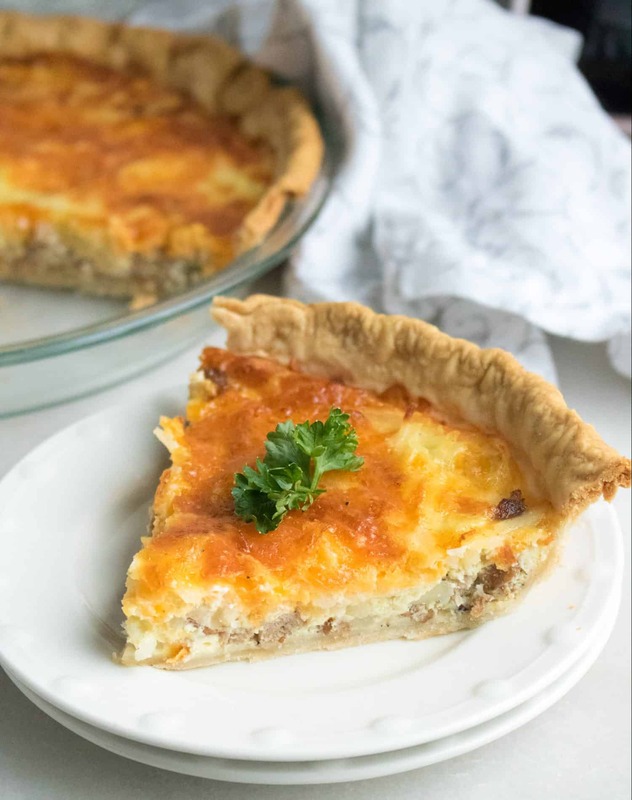 Learn how easy it is to make a breakfast quiche ahead of time and have it ready to reheat whenever you like! We really like to get as much protein as possible with our breakfasts and quiches are a great way to do that. Years ago, I noticed that local grocery stores sold precooked quiches in their refrigerated deli section with instructions on how to heat up a single slice at a time. I picked one up and brought it home and enjoyed a delicious protein rich breakfast every morning for a whole week on that one quiche! Once that one ran out I started to make my own, which was even better since I could customize it. 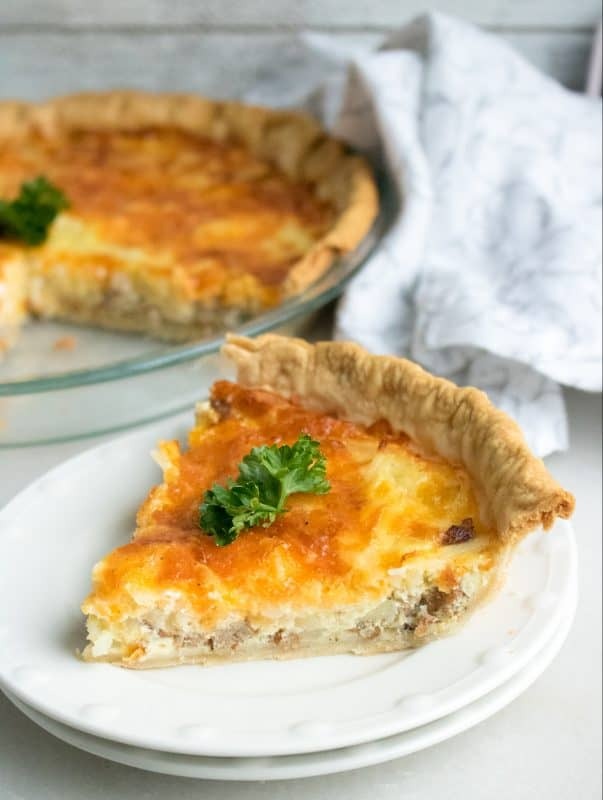 A breakfast Quiche is one of the simplest things you could make, especially when you use store bought crusts. Take your favorite meats – or leave meats out entirely – add some veggies if you like and top with a little cheese. The egg mixture brings it all together in this wonderful blend of flavors and textures. Bake them fully ahead of time and store in your fridge for a quick breakfast when you need one. I also grab a slice for lunch from time to time and we have had this for supper on more than one occasion. With our first ever RV trip planned (we are renting an RV, how fun! ), I’ve already added a few pre cooked quiches to our menu because although we will have a full kitchen, I want to spend as little time as possible using it. There really is no limit to what you can add to a quiche in terms of ingredients. In this particular one we are using Cooked and crumbled turkey sausage (I LOVE Jennie-O brand that comes in a roll, it is just perfect and while we only eat turkey sausage now our son eats all kinds and he still prefers that brand to traditional sausage), frozen cubed hash browns (my husband’s request), and cheese. Of course you’ll always need eggs, milk, and some salt and pepper. For the crust I like to use refrigerated crusts that you roll out into your pan or just a frozen pie crust all ready to go. 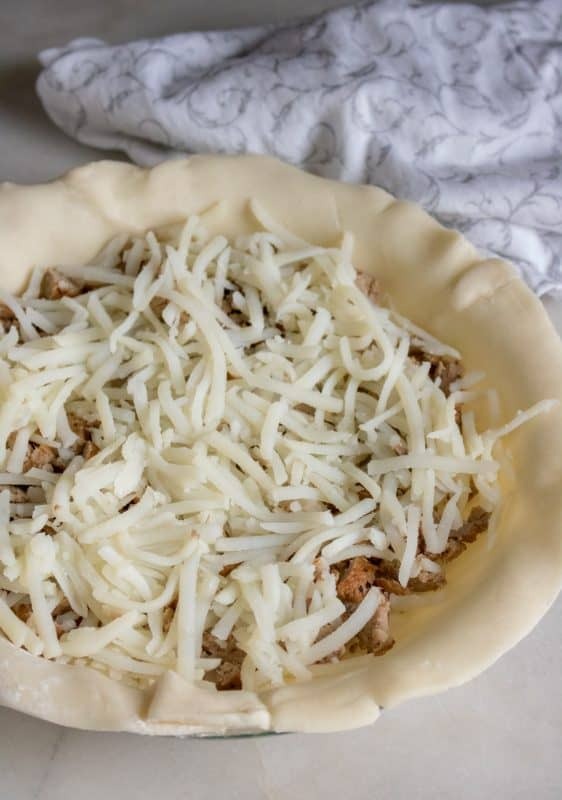 A regular crust will work just fine for this one but if you wanted to get a deep dish one you could double the eggs to fill it. Place your pie crust in your plate or just sit out your frozen pie crust if that is what you are using. Put filling ingredients inside. I am using turkey sausage, hash browns, and cheese. I’ll add more cheese in a minute so you’ll see that in other pictures. 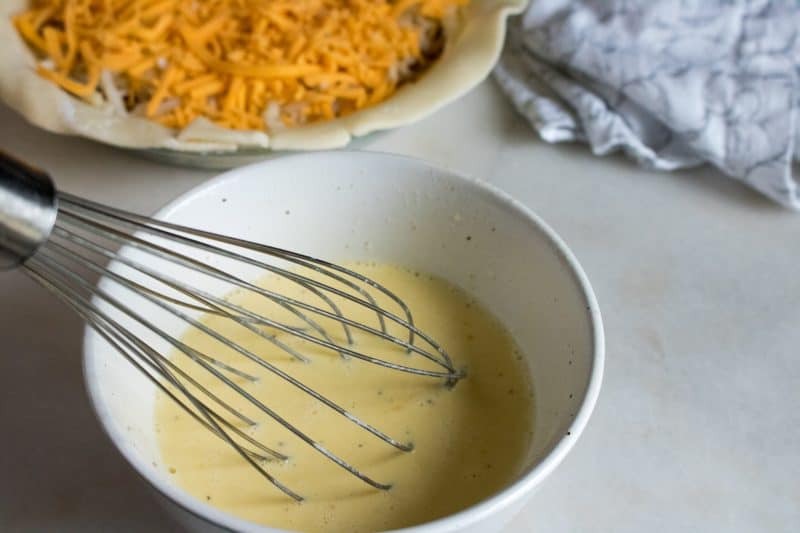 I tend to use this recipe to “use up” shredded cheese that is lingering in my fridge from other recipes. The complete recipe is at the end of this post in a printable recipe card. 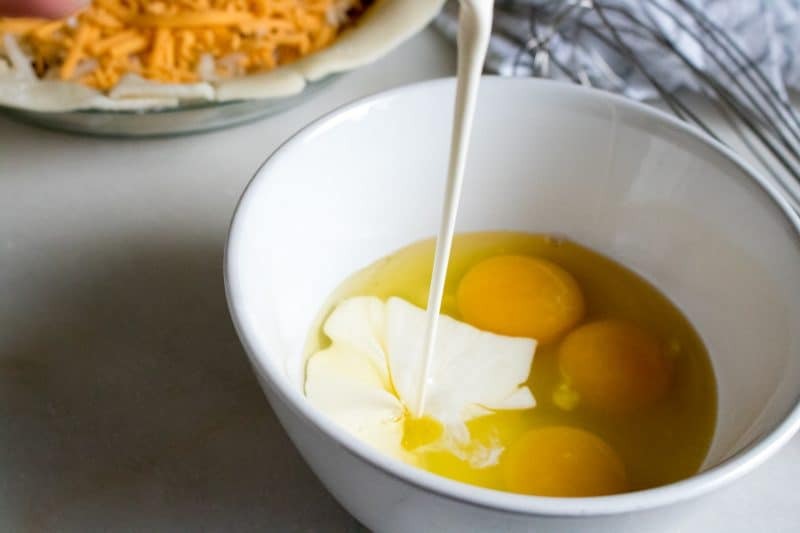 Place your eggs, milk, salt, and pepper in a medium mixing bowl. Beat ’em til they’re well blended. Top with cheese of your choice or whatever cheese you have on hand. This is where I like to clean out the refrigerator so sometimes I use cheddar, sometimes mozzarella, sometimes a blend of both. All done and ready to go in the oven! Pie can be served warm immediately or allow to cool, wrap in foil, and store in the fridge. This also freezes well, just make sure you wrap it up really well. My favorite freezer tip is to go ahead and cut the pie into slices and freeze those individually. To reheat just take a single piece and microwave it until heated through, about one minute (depending on your microwave). If using refrigerated roll out crust, roll it out into a 9 inch pie plate. If using a frozen crust set it out on the counter. 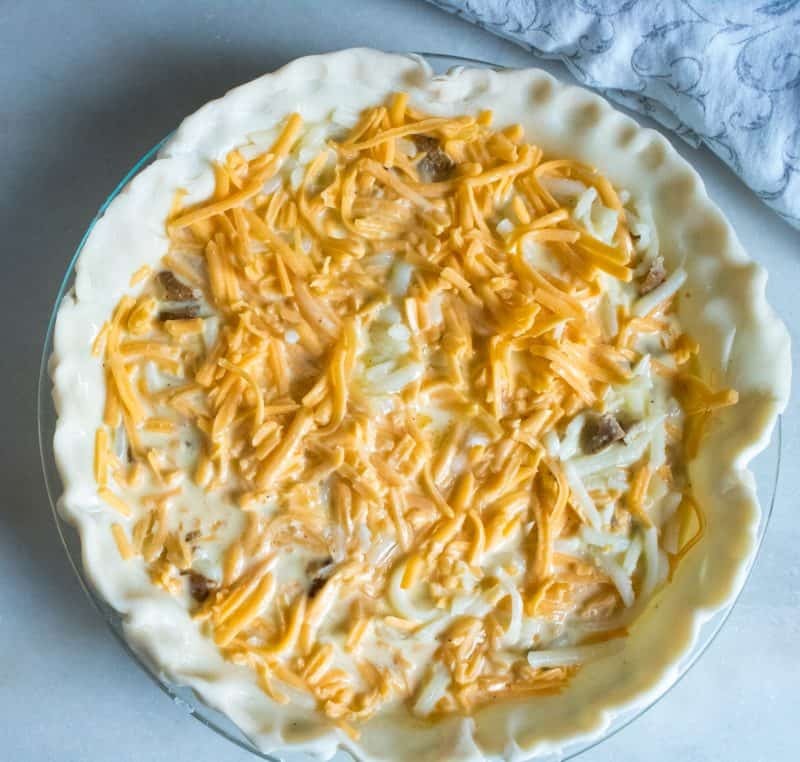 Evenly spoon or otherwise place sausage, hash browns, and cheese into pie crust. In medium bowl place eggs, milk, salt, and pepper. Beat with a fork until well blended. 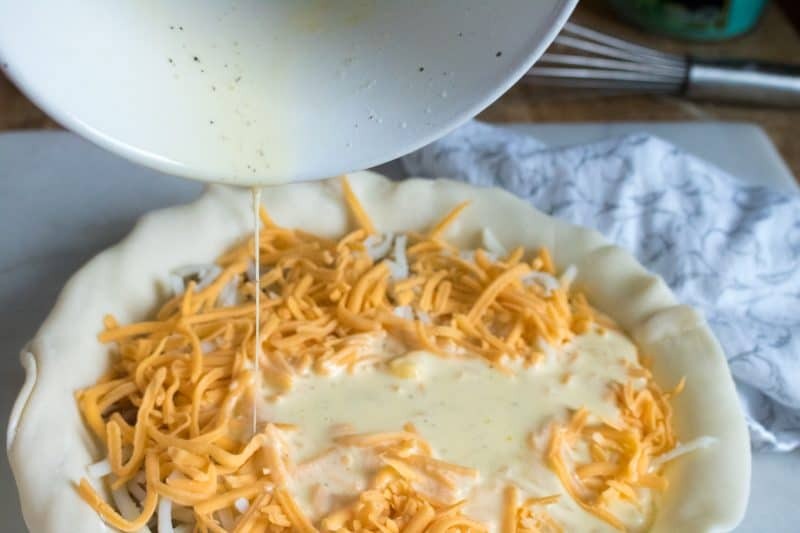 Pour over ingredients in pie crust. Bake at 350 for 40-45 minutes or until lightly browned on top. Quiche might still have a tiny bit of jiggle in the middle but it will set once you take it out. Serve warm immediately or allow to fully cool, wrap in foil, and store in fridge for quick heat up meals throughout the week. This will keep for up to a week in the fridge. To reheat, take a single slice and place on a microwave safe plate. Heat in microwave until heated through, about one minute. The past is valuable to you as a guidepost, but dangerous if you use it as a hitching post. Hi! Love this recipe thank you! If I want to put the filling in a deep dish crust do I double the eggs and milk or just the eggs? Do you think these would freeze as well if you did not use a crust? fewer carbs for me. You will love the RV our favorite spot every weekend in spring/ summer Kitchen has everything I need but a kitchen aid mixer!!! Lol. We are looking forward to it!!! I will let you know how it goes when we get back! His Majesty and I have a small quiche for breakfast at least once every camping trip. It’s one of our ‘camp meal’ traditions. Our RV has a lovely kitchen, but I don’t go camping to spend time indoors. I want to be outside as much as possible. We’ll bake the quiche in the BBQ or gas grill. Turns out great. Thanks for the recipe. We’ll be sure to try your version out. Wishing you a wonderful camping holiday. THank you so much Dawn, we are looking forward to it!!! What a great idea! Looking forward to trying this out. Thank you Diane, I hope you get the chance to try it soon! Yum – it is very good. Will be on our menu often!!! Luv the fact that you can make it the day before – I am not an ambitious morning person. 🙂 I hope you enjoy it C!! Can this whole quiche be reheated in the oven? Thinking of serving this for our ladies first day back Bible Study group in a week. Would be so wonderful to make ahead and reheat the day we meet. It sure can! The instructions are in the post, it can also be frozen and then reheated!! Yes, I would double them both Amy. Hi Christy! 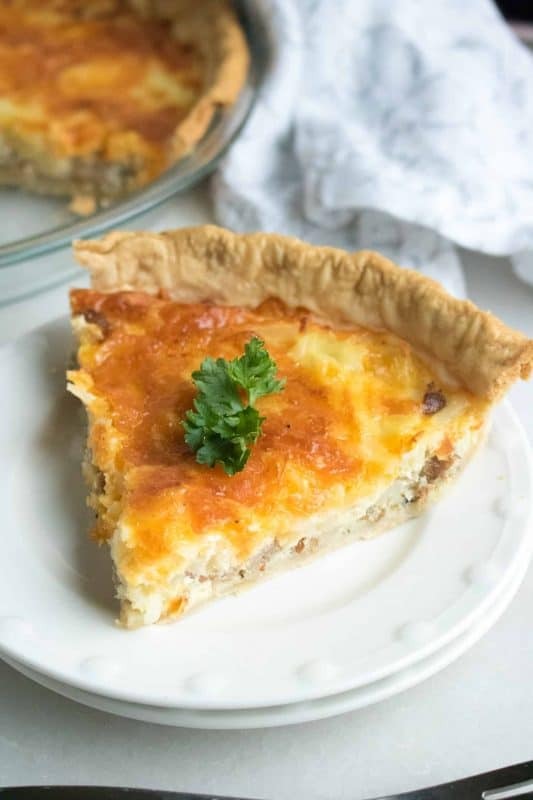 Would I need to cook veggies before adding to the quiche? not unless you just want to. I toss ’em right in!